Celtic rock kings Peatbog Faeries bring their award winning high-energy show back to the Trades Club on Wednesday August 19th. The Peatbogs have always sold the club out with their unique brand of Celtic fusion that won them Best Live Band 2008 at the prestigious Scottish Traditional Music Awards. Years on the festival circuit have built them a fiercesome live reputation stunning massive crowds with intense kaleidoscopic soundscapes fusing bagpipes, whistles and fiddles with one of the best rhythm sections around. The weekend kicks off with another traditional act as highly regarded singer songwriter Reg Mueross makes his debut at the club on Thursday August 13th as part of Steve Tilston’s Trades Roots sessions. A former member of Hang Wangford’s Lost Cowboys it is a mark of Reg’s growing reputation that he earned an invite to play at the Teenage Cancer Trust folk gig at the Royal Albert Hall sharing a stage with such folk luminaries as Seth Lakeman, Fairport Convention and Eliza Carthy. 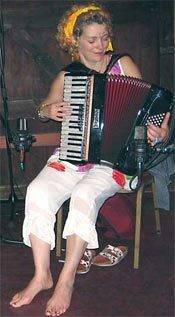 Support on the night comes from leading accordionist Karen Tweed who left the Poozies in 2007 to pursue a successful solo career that has seen her playing all over the world including gigs in Japan and Lesotho. The weekend finishes on a high as Becks and the Bullets make a welcome return to the club on Saturday August 15th with their joyous mix of pop, ska and jazz. Packed with some of the best session players in the UK and blessed with a high quality frontperson the Bullets have written some of the funniest and poignant songs ever penned by a Valley band. “It’s a real coup for us to have the Peatbog Faeries play the Trades as they are without doubt one of the best live acts anywhere in Europe and I would advise early booking as this gig always sells out,” Trades Club spokesperson Paul Clarke told the Hebden Bridge Web. “Mike Harding not only hosts the best rating folk show in the UK but he is a significant folk artist in his own right so when he says Reg Mueross is one of the best song writers we’ve ever produced then you know he is the real deal.